When you’ve recorded eight studio albums over fifteen years, there’s bound to be songs that have been forgotten. 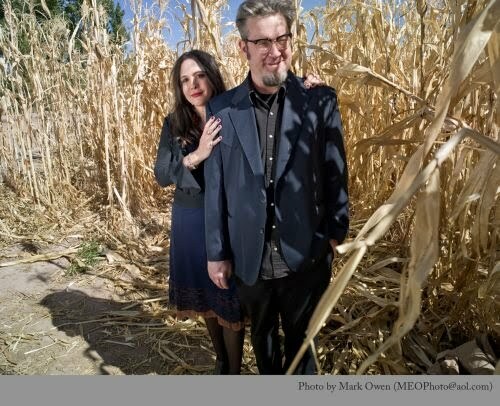 The Handsome Family has revisited their past and gathered up these treasures; a smattering of covers, alternate takes, unreleased songs and bits of their history and put them together on the self-released Scattered: A Further Collection of Lost Demos, Orphaned Songs and Odd Covers which the band will support with a tour beginning in early January. Fans of Rennie and Brett Sparks’ haunting and hauntingly beautiful stories in song will be delighted to know that they’re in for a double treat: The Handsome Family will be touring the west coast and they’ll have copies of Scattered with them. The CD is only available at tour dates and on their website, http://www.handsomefamily.com. The tour, which begins in Vancouver January 19th, will take them down the west coast to Santa Monica. The Handsome Family have toured extensively throughout the USA, Canada, Europe, Australia and New Zealand, their live performances sometimes consist of up to a six-piece band and other times just Brett and Rennie. Despite the dark mood often created by their music, A Handsome Family show is fun, with Rennie bantering and telling more stories between songs, and Brett collapsing the illusion of tradition by sometimes using a laptop for drums. The Handsome Family are known for Rennie’s evocative, descriptive lyrics, Brett’s deadpan baritone and their sparse, traditional bluegrass instrumentation. Their work has garnered praise from Pitchfork, Billboard, Spin, The BBC, Mojo and more. Their songs have been covered by many artists, most notably: Andrew Bird, Christy Moore, Cerys Matthews, The Sadies and Sally Timms. Honey Moon, the Sparks’ eighth studio album was released in 2009 to celebrate their 20th year of marriage.